Our winery, with its nature and wildlife theme, opened its doors in November 2007 and the response has been overwhelming. 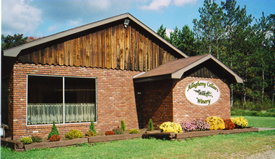 The winery is nestled in the beautiful mountains of the Allegheny National Forest in Warren County and located directly off Route 6, one mile east of the traffic light in Sheffield, PA. Our tasting room and gift shop provide a comfortable “woodsy” atmosphere where visitors are encouraged to sample from a wide selection of wines from dry to sweet. Take your time to browse the many wine related gifts we have to offer as well. You may just find that perfect gift for someone special.